Raw versions of popular baked goods are my favorite way to treat my family (and myself) to sweets without wreaking havoc on our bodies. Many raw sweets are a great way to fuel the body properly for sports and other fitness activities as they are a good mix of healthy carbs and a little bit of protein. 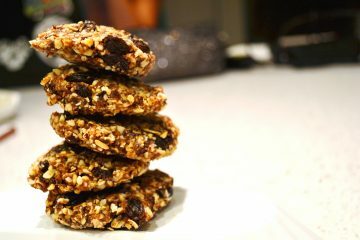 These Cinnamon Raisin Oatmeal Cookies are my favorite version; they never last very long in my house whether as a pre-workout meal or afternoon snack. It was love at first site and first bite with this colorful and vibrant spinach salad that I first had at Pie for the People in Joshua Tree, CA. 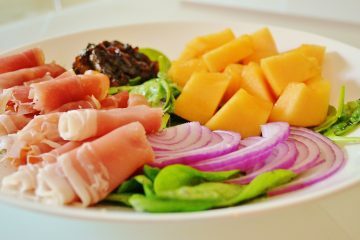 The sweet cantaloupe chunks and salty Italian dry-cured ham are nestled next to Guinness caramelized onions and raw red onions and served in a sweet vinaigrette. 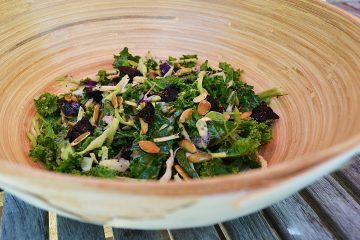 This summer salad inspires you to slow down, pull up a chair to a table under a shady tree, pop open a crisp bottle of white wine and invite a handful of your favorite people to toast the blessing of your abundant life. Yes, truly..it does! Prepackaged salad greens have really come a long way from the standard mix of iceberg, romaine, radicchio and carrot shreds. You now have your choice of micro greens, blends of baby kale, baby spinach and baby romaine, and other specialty lettuce blends, but it was a bag of kale, broccoli slaw, and shredded Brussels sprouts packaged with dried cranberries, pumpkin seeds and a poppy seed dressing that inspired me to make this kick-up raw salad that pairs perfectly with your fall chilis and stews. I did not like the rancid soybean oil dressing that came with it so I decided to create my own version. I am glad I did as this has become a much requested salad from family and friends. It’s a great way to sneak in those nutritional powerhouse cruciferous veggies that we seem to avoid. A secondary bonus is it’s all raw so we get a great boost of plant enzymes sorely lacking in our modern diets. This light and fresh deli-style salad that I originally bought from Stater Bro. Market in Joshua Tree sustained me for a couple days whether before a hike in Joshua Tree National Park or as a light snack on one of our many car rides during our southern California summer vacation. I know this salad will become a permanent addition to your summer rotation of favorite, go-to recipes. 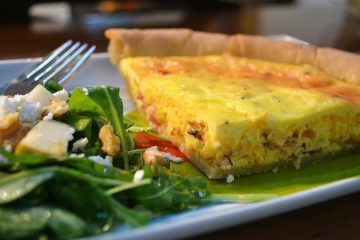 This was a surprise hit as egg pies or quiches do not necessarily elicit much excitement unless you are in your local coffee shop looking for something healthier than scones to go with your just-perked java. My youngest loved it so much she asked if she could have it for breakfast the next day. Because this is such an easy recipe to make with most of the time invested in waiting for it to bake, we whipped up another quiche, baked it, and cooled it all before her bedtime. My oldest daughter, who typically does not care for eggs, loved it, but was especially keen on the chopped walnut, pear and arugula salad, going back for seconds. The whole meal is a keeper! 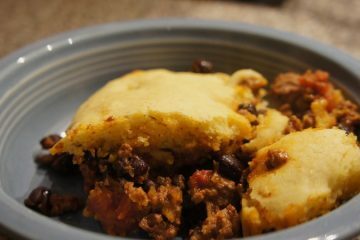 Although tamale pie has its origins in the United States, most likely California, many American Hispanics prepare this ultimate comfort food. Not to be confused with Mexican tamales, tamale pie is a baked casserole of ground beef, cornmeal, tomatoes, olives and cheese. I simplified the original recipe, which calls for preparing cornmeal and pouring it into the bottom of a pie dish and again topping the beef mixture with more cornmeal, by substituting a corn muffin mix. 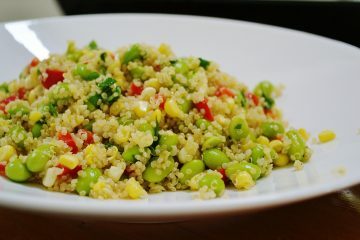 A simple side salad completes this family-friendly meal. I was flipping through a Cooking Light magazine and came across Beef Kefta Patties with Cucumber Salad. Kefta? A quick internet search yielded my answer: Kefta is the Lebanese/Syrian dialect for Kofta- a Middle Eastern, South Asian and Balkan meatball or meatloaf, although it is also referred to as kefka in Morocco. 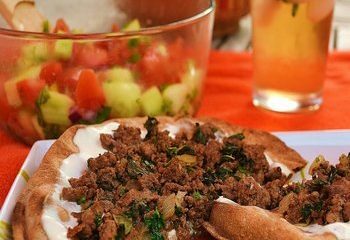 In the Middle East Kefta is ground beef or lamb, typically mixed with cumin, paprika, minced onion, coriander and parsley. Cinnamon, hot ground pepper, and mint leaves are optional. The recipe below shows traditional quantities of these spices and herbs. I have, however, sautéed the kefta mixture in favor of forming into kebobs and made it as the base for a flatbread pizza. In honor of its Lebanese roots, serve it with a cooling cucumber-tomato salad. 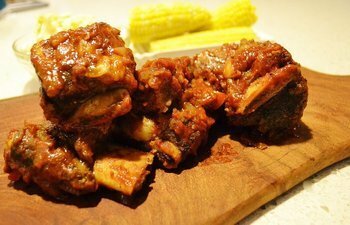 Do you have a craving for BBQ ribs, but no time to precook them, bake them, and then grill them? No problem, as this slow cooker does it all for you. It’s finger-licking, fall-off-the-bone good and pairs perfectly with cornbread, coleslaw and an ice cold beer (fresh lemonade for the kids). 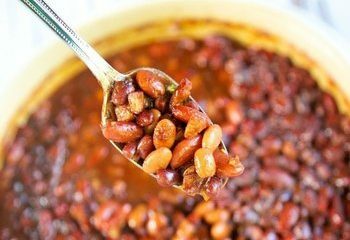 This is my whole foods version of baked beans that can be eaten as a main dish; a little bit tangy and a little bit sweet. Serve this with a side of greens, homemade cole slaw or a crispy salad. 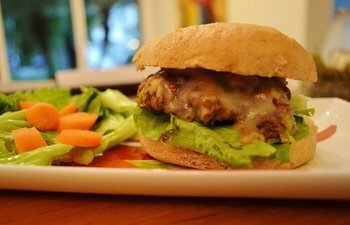 I like it over brown rice, but a warm loaf of baked bread or dinner rolls, and chunks of cheese would also suffice. I thought it would be interesting to modify a classic meatloaf to a handheld version AND have my slow cooker do all the work. Tastes just like a cheesy meatloaf; mission accomplished! I created The Whole Meal with a vision of educating others in mealtime preparation focusing on delicious, healthy and simple recipes. To good food and a better life!